Every woman in universe looks pretty in bride costume. A beautiful bride costume combines seduction and elegance. Bride costume can be wonderful idea to make u look beautiful on Halloween night. Bride costumes idea for couples ranges from unique to conventional. These brides Halloween costumes are perfect for females of all ages. These costumes are appealing enough to make you look charming and your little angels look cuter. You can also wear a blonde wig, bright red lipstick and a mole along with a unique hairstyle. We also provide wide range of accessories to complete your bridal look. 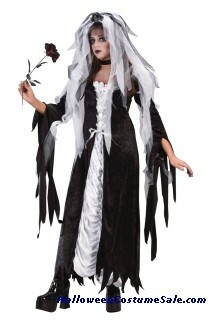 More than dozens of Halloween Bride costumes are available at our site to fit everyone from children to plus size women. These bride costumes are available in many different styles to choose from including corpse brides, zombie brides, cute Brides, Pretty Brides, Bride of Frankenstein and beautiful bridal costumes. If you're thinking of buying a bridal costume for Halloween this year, you can find lots of variety at our site at great prices. Take a look!